How are you? Good? I hope so. I’m good too. Life is completely crazy right now, balancing school and extracurriculars plus applying to college (ugh) but slowly I’m coming out of the haze. And, to prove it, starting today I’m putting myself on a regular posting schedule. Because that’s what I need, more deadlines. Okay, confession: I’m a chronic procrastinator. It’s always been a problem for me, because why do things now when I could do it later? I know, I know, it’s a terrible work ethic, but I always get everything done on time, so what’s the difference? I’m hoping once I give myself hard due dates to post on here, I’ll be on more regularly. Because I love you guys and I miss you. Cross my heart. Another confession (do you like this segue? ): I don’t really like squash. It’s a shame, because it’s such an integral part of my favorite season, autumn. There’s something about the smell of crisp air and leaves crunching under your feet that drives me crazy. 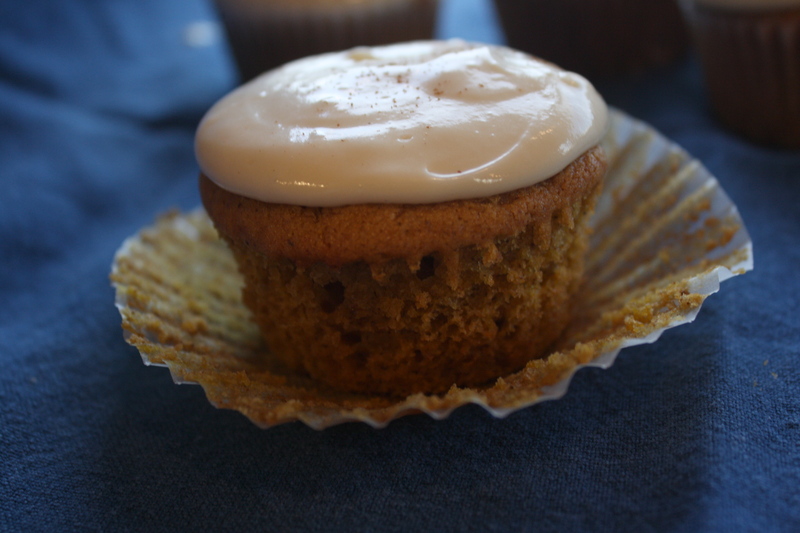 And while I’m head over heels for apples and I adore cinnamon and spices, I’m pretty indifferent on pumpkin. I mean, sure, I’ll eat pumpkin pie if you made me, but I won’t ask for it (okay, maybe I might). Completely forget about butternut or spaghetti squash though, yuck. But good news! I discovered that pumpkin is good! When it’s not plopped into a pie crust and baked untill it’s gooey, but instead incorporated into other means of deliciousness (ie whoopie pies, ice cream, cupcakes) it pretty much rocks. I’d even choose to eat it. Crazy, right? Right. These cupcakes are actually the one of the first actively autumn dessert I’ve baked this year.And they hold up well to the task. They taste like pumpkin and spices, but not in an overwhelming way. They are simultaneously bold and subtle, perfectly light and fluffy instead of dense and gooey as pumpkin baked goods tend to be. The maple cream cheese frosting cuts the sweetness a bit (plus it’s maple cream cheese, aka my favorite type of frosting. Seriously it’s so good.) 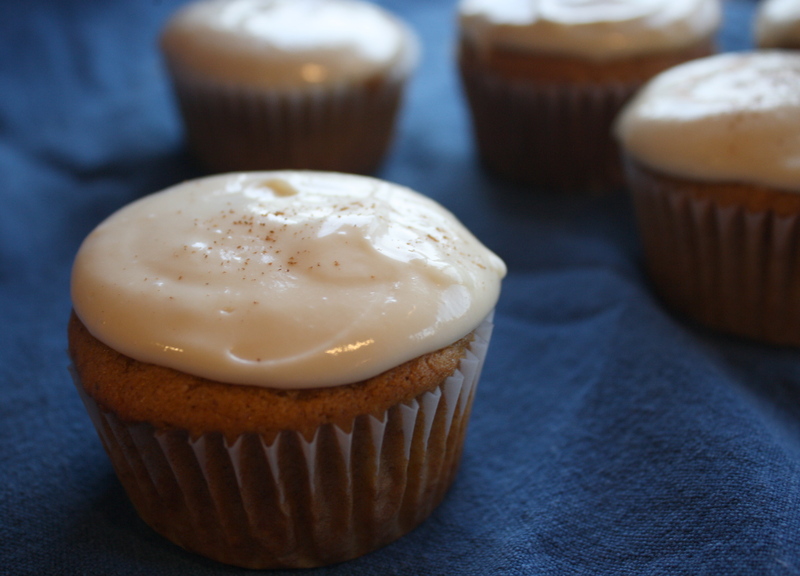 Sprinkle a little extra cinnamon on the tops of the cupcakes when you’re done, and you’re practically eating November in just a few bites. 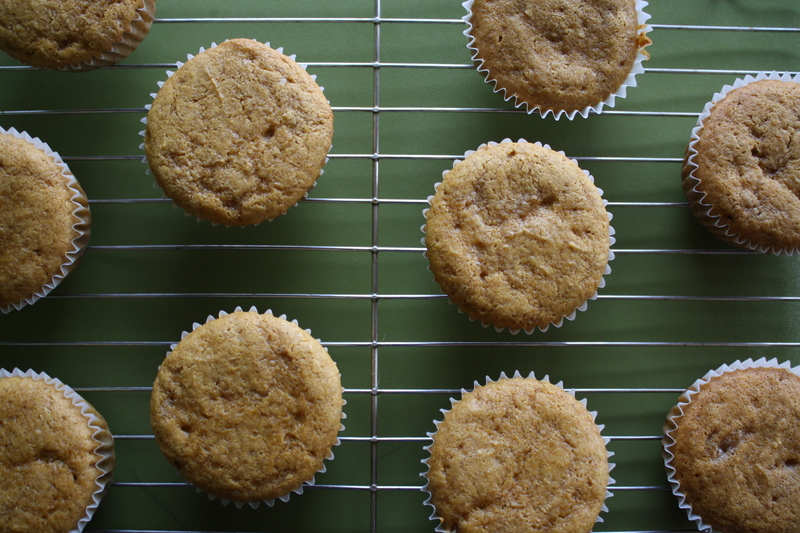 Light and fluffy, these cupcakes have a distinct pumpkin spice flavor without being overwhelming. 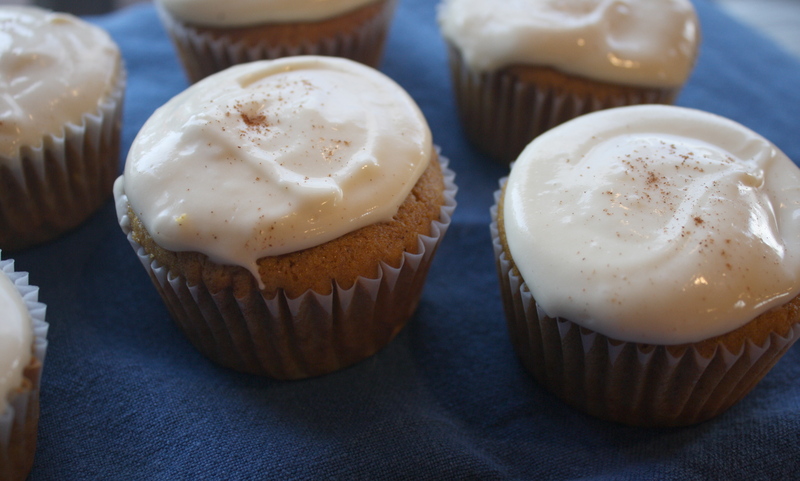 Top them with maple cream cheese frosting and you have an ideal fall dessert! Preheat the oven to 350 degrees. Line a cupcake pan with about 20 liners. Sift together the flour, baking soda, baking powder, spices, and salt in a medium sized bowl. Set aside. Cream the butter and sugars together until light and fluffy, about 5 minutes. Add eggs, one at a time. Combine the buttermilk and the vanilla. With mixer on low, slowly add the dry ingredients, alternating with the buttermilk (ie, 1/2 dry, all of wet, 1/2 dry). Mix until just combined. Slowly add the pumpkin purée and mix until just combined. 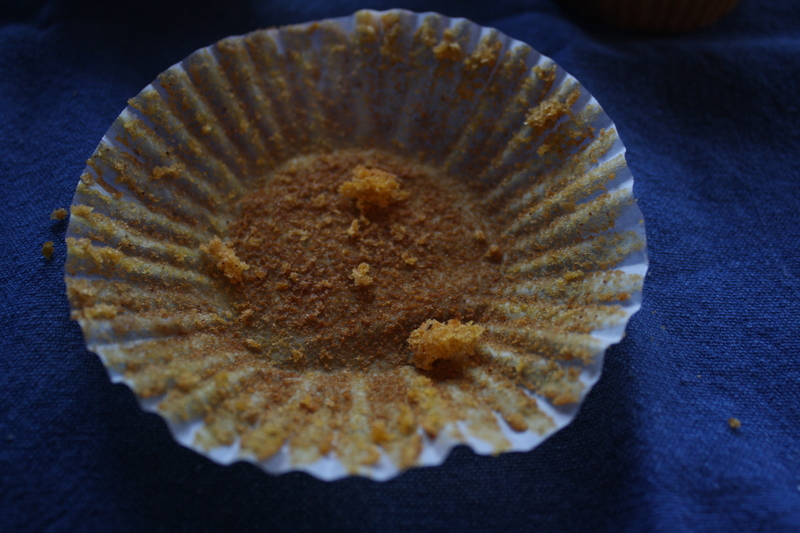 Scoop into cupcake liners so that they’re each 3/4 the way full. Bake for 20-25 minutes until a tester comes out clean. In a stand mixer, beat all the ingredients together on medium speed until fluffy. If it is soupy, let it chill in the refrigerator to set up. 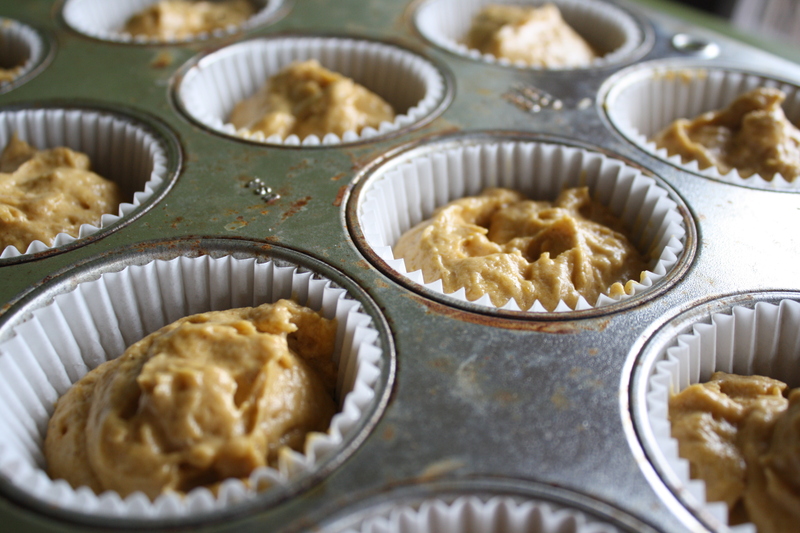 Once cupcakes are completely cooled, pipe or spread frosting on top of each one. Sprinkle very lightly with cinnamon.